We offer two easy and time-saving ways to track email conversations. 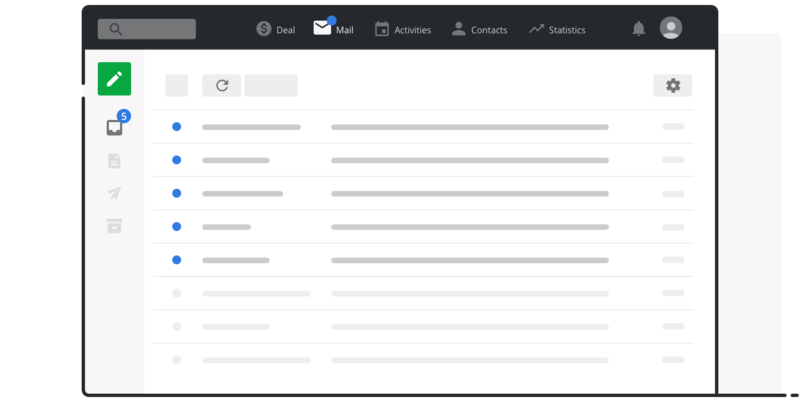 In addition, we'll connect your emails automatically to your contacts and deals, so you'll have a full overview of everything that's happening with a prospect in one place. You’ll save time and improve sales productivity. Pipedrive’s Sales Inbox includes cutting-edge features designed to save you time when doing your daily tasks. You’ll be able to track emails, use customizable templates, and fully sync your inbox to any major email provider. You will also be able to send emails to your contacts directly from Pipedrive, which will then be synced back to your inbox. If you find that email is not such a key part of your sales process, or even if the volumes are low, you may find that Smart Email BCC meets your needs. It allows you to easily copy emails to Pipedrive by using your personal name@pipedrivemail.com email address. Simply BCC that address, no matter which email provider or client you use, and the emails will appear inside Pipedrive. These emails can be copied to the relevant deals and contacts in a blink. You can also forward customer emails to Pipedrive to update existing deals or create new contacts. Following either method, you will be able to look at a specific deal or contact and see all emails associated with that deal or person at-a-glance. In addition, you have full control over who sees the emails you’ve sent or received. The default settings will always be ‘shared’ as we believe selling is a team sport. But should you choose, you can change this to ‘private’, which means your team members will not be able to see emails you have sent to Pipedrive. Increase the number of emails you send, while still maintaining a significant personal touch. Choose from one of Pipedrive’s templates, or customize your own email templates. Either way, you’ll now have time to focus on the part of the discussion that matters most while letting Pipedrive handle the rest. Schedule activities and link email contacts with relevant deals directly from your sales inbox. Advancing your deals has never been more convenient, and you can do it without closing your email thread. With email tracking, you’ll get real-time notifications as soon as a prospect opens your email. You’ll also be notified if they’ve clicked on any links, which makes it easier than ever to know when to follow-up.